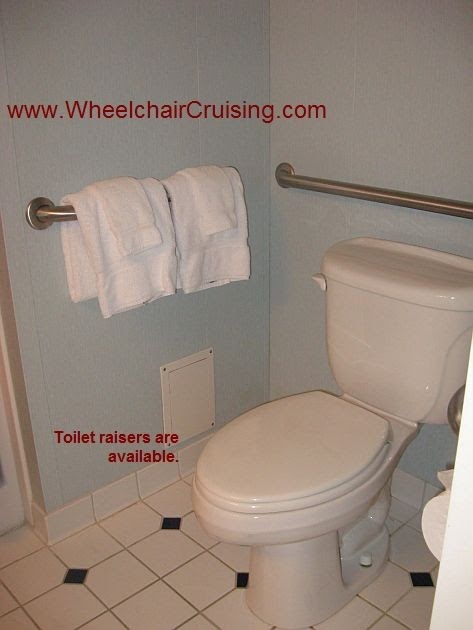 Cruises for Wheelchair Users & Slow Walkers: Wheelchair River Cruising on American Spirit? Maybe. Wheelchair River Cruising on American Spirit? Maybe. For many people, river or “coastal waterway” cruising brings thoughts of peacefully floating by scenic coastlines and visiting historic cities. 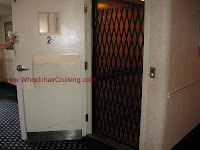 But for many others who have a disability, it also stirs thoughts of disappointment and frustration as most of these smaller--- and often older--- ships are not wheelchair accessible. Bui lt in 2005, American Spirit as well as most of the ships in the American Cruise Lines’ fleet are the newer of the small ships sailing these types of itineraries. For some people living with a physical disability, she represents the ability to now enjoy river sailing. For others, she will continue to be another river sailing disappointment. The success of a vacation is knowing the real answers so that you can make the best choice for you. Touring American Spirit recently, I didn’t break out my tape measure so I’m going to give you estimate measurements based on memory. Short, narrow (around 20-24” wide) and very steep gangway that opened down onto two large blocks that made them “steps.” No way to push a manual wheelchair up it and no way for a powerchair or scooter to roll up it. Anyone unable to walk (with or without assistance) would have to be carried. A lip into the accessible cabin’s shower stall of at least 3”. A roll-under sink that’s not truly very deep. A lip to the balcony that’s at least 3” and couldn’t be ramped on the balcony side of the doorway even if they ramped the cabin side. There is about a 3” step up into the hallway leading to the Dining Salon. There’s no accessible public restroom. I’m hopeful that American Cruise Lines will consider more thorough access for future ships. Frankly, even if they could just switch to a gangway that was wider and could lengthen when needed, and if they ramped the lip leading toward the restaurant, most full-time wheelchair users could be accommodated on this ship. The good news is that this ship, unlike many older river boats, is accessible for those people who use a manual wheelchair “part-time” for distance as well as those who are somewhat ambulatory with the assistance of a walker, cane or crutches. I think there’s too much compromise needed for someone using a scooter part-time. To see more access photos of this ship, visit our American Spirit photo gallery. To make a reservation, speak with one of our Access Travel Team specialists who can answer your questions and assist with your details when helping you plan your trip.